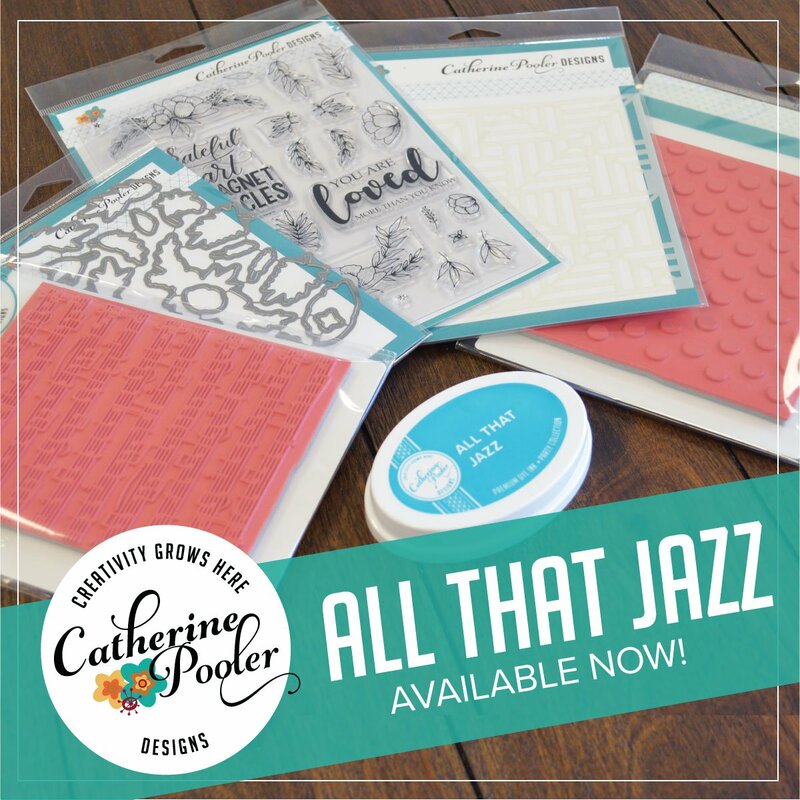 Welcome to Day 1 of the All That Jazz release blog hops for Catherine Pooler Designs. 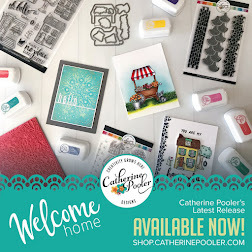 On March 20th, new stamps, dies, stencils, ink and card stock hit the store. The Creative Team will be sharing projects introducing you to the new products over the next few days. 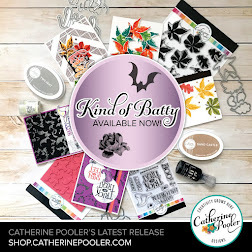 The previously released products from the Counting Blessings Stamp of Approval will also become available for individual purchase, so you'll be seeing some of those products as you hop along! I have two cards to share with you today. 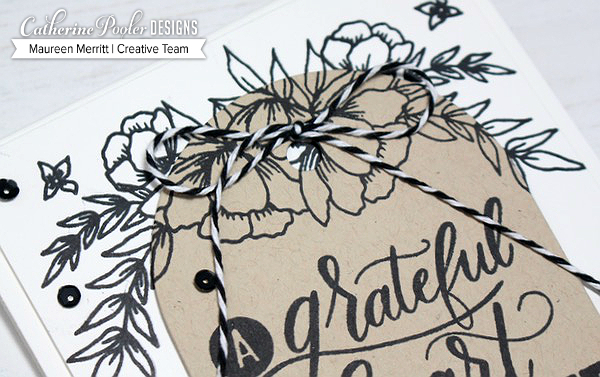 This first uses the Grateful Heart stamp set. It also shows the Kissing Technique, which allows you to use BOTH the Music Background and Doin' the Polka Dots Background together!! Don't you think this is a fun way to create a background? I definitely haven't used this technique enough! Next, I stamped and die cut images from the Grateful Heart stamp set. I sponged white card stock with Rose Petal ink before die cutting the flowers. 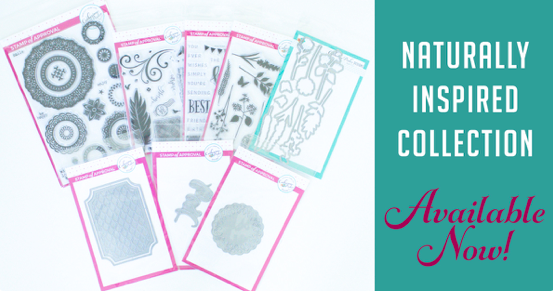 Whenever I use floral stamp sets, I always stamp and die cut way more pieces than I'll ever need. I find that easier than stopping the creative process to cut one more leaf. I arranged the flowers around the sentiment and grounded the design by adding a strip of the lovely Black Tie Gala patterned paper (which I told Catherine that she could just send it all right here ;) Love this new product!! A must-have for sure! 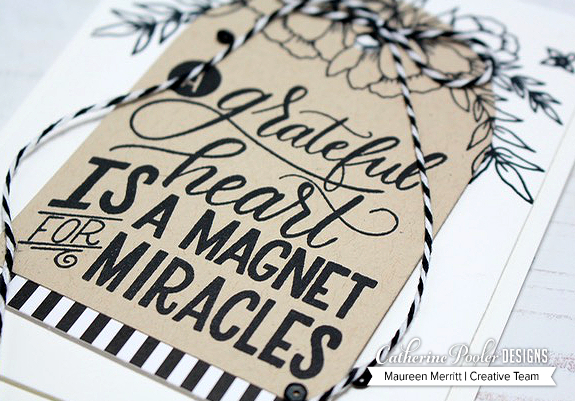 My next card also features Grateful Heart. It also shows off the Black Tie Gala patterned paper and the NEW Sand Dunes card stock. My design this time is much simpler but still packs a punch. I stamped the larger floral swag in Midnight ink on both a white card panel and a tag that was die cut using the Tags, Etc die set and Sand Dunes card stock. Sand Dunes is the perfect neutral card stock! When the tag was adhered to the panel, I lined up the images. I love how that makes the florals just pop! The rest of my card is pretty self-explanatory! A strip of Black Tie Gala patterned paper (you'll be seeing this on every card for a while...SWOON! 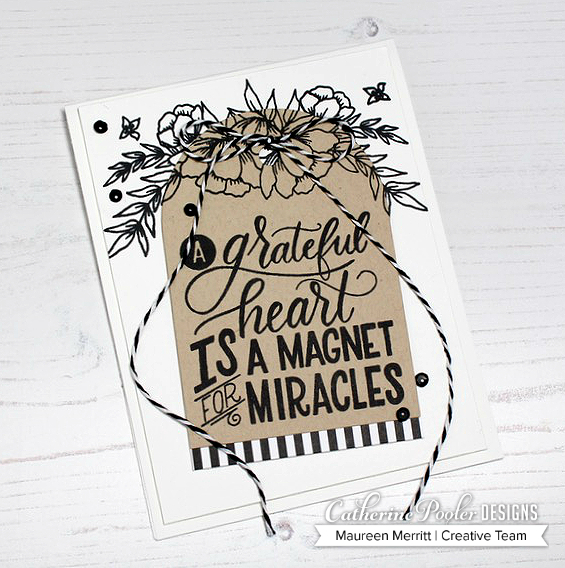 ), my favorite black and white twine and a scattering of sequins finish this CAS card off perfectly! I hope that you've enjoyed my projects today. I'll be back on release day with two more cards for you. The background on the first card is sooo creative! 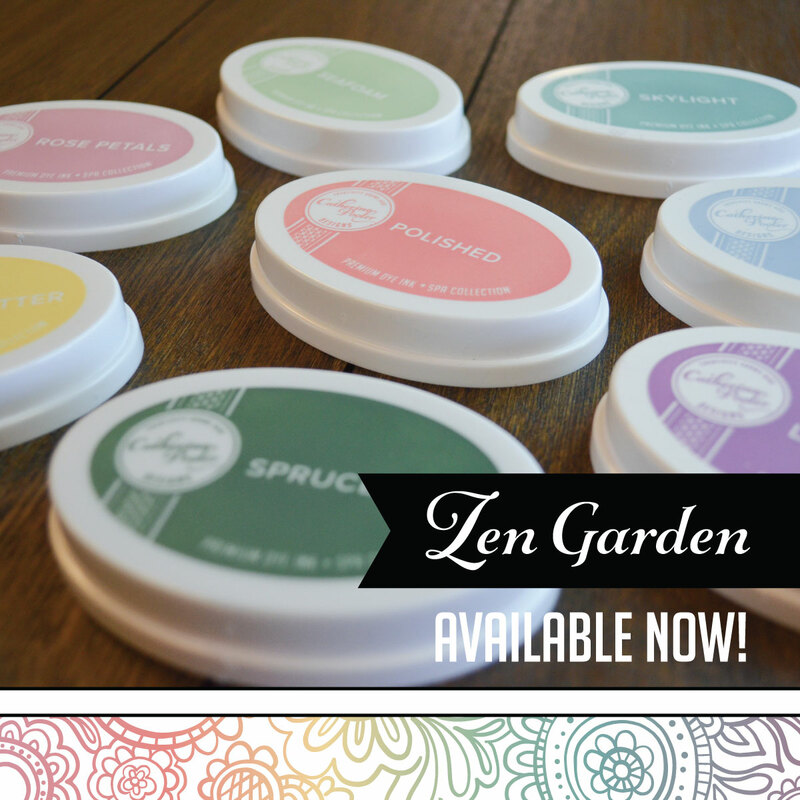 And the tag card is simple, yet stunning as well! Thanks for sharing! The kissing technique is done impeccably!!! Love the pink & black!! SO COOL! I am going to try that technique! Love your cards! What a cool background! but will try it again. Wow, I love the technique with the polka dots. Would never have thought of that. Must give it a try. What great cards you made. They are just lovely along with the colors. Thanks for sharing and have a nice week. 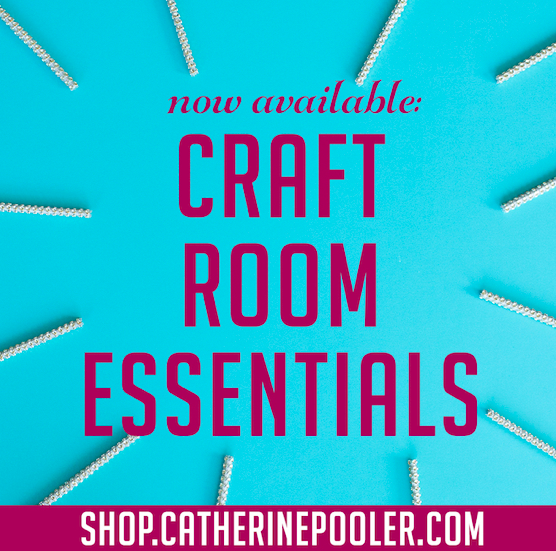 Love the polka dots on your pretty cards! Maureen, your first card is so creative, Wow! Love both of your cards they are amazing, Thank you for sharing and have a great week to come. These are stunning! 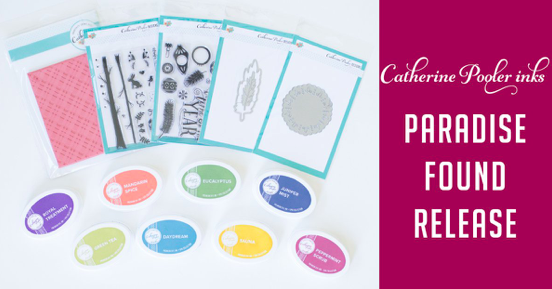 Love your color combos and cannot wait to get some of these in my workshop. Your cards are absolutely stunning, Maureen!! The way you doubled up the background stamps on your first card is pure GENIUS! These cards are amazing! The music stamp kiss technique is such a great idea!! Stunning cards - love the classic pink and black! Your cards are really elegant. I especially love the sand and black color combination. Beautiful cards - so elegant. I love the new papers too! Beautiful cards! I'll have to try the kissing technique! Maureen I just love your cards, so clever with that kissing technique, such a wonderful effect and beautiful colour scheme. Wow! I would never have thought of doing the kissing technique on a background stamp. That is very unique! WOW Maureen, so beautiful! You are so creative you make everything shine! What STUNNING cards!!! I love the background on the first one!! Wow! I have never seen the kissing technique before and it is brilliant! I can't wait to try it. Thank you for sharing! I love seeing cards with no coloring since I don't color much. Oh, both your cards are great! Thanks for explaining the kissing technique with a twist you used on the first card. So cool! The 2nd card is my favourite though. So pretty! beautiful cards. I had forgotten about the kissing technique--thanks for the reminder. will be trying this soon. Your kissing technique is AWESOME!!! Love the pink musical polka dots. The rest of that card is wonderful, too. but that background sets the tone. I just discovered the kissing technique as you describe it here. And it looks great with polka dots (which I love). Sigh.... you blow me away Maureen! I am in love with those kissed polka dots girl! OH EM GEE... love it so much!!! Beautiful cards. Love the kissing technique on the first cards. OH how pretty! Love the classic colors! Both cards are gorgeous, Maureen! I'm going to try the kissing technique right away. Your second card is perfect! Love the colors & the Sand Dunes paper is awesome! It's at the top of my wish list! Love love love the kiss technique you used on the first dolka dot card. I can’t wait to try that. Thank you for the inspiration. Pretty cards! Love that technique you used with the dots! I love the tag card! Its simplicitic look masks the "work", and allows your creativity to shine! Beautiful cards! I love how you layered the elements on both cards and the kissing technique with the polka dots is fabulous! Beautiful cards. Love the background with the kissing technique. And the second card is really classy. GREAT techniques & beautiful card's! Definitely going to have to copy both. Thanks so much for sharing! Your card is top notch and I love how you incorporated the music in the polka dots..... it's stunning! I've not heard of the kissing technique either but what an amazing result you got, a definite must try for me. Your cards are brilliant. PERFECT cards!!! Thank you for sharing with us. Love your blog. Cards are super!!! The sand dune card stock is a must have. I really love the peek-a-book background of the first card. Thanks for the inspiration. Love love love your cards Maureen! That Kissing technique is sweet! And the 2nd card is fantastic! The flower swag is just perfect! I really like these! The flowers look wonderful the way you did them. Wow ... must add your techniques on my list of things to attempt! Love the results of the "kissing" technique. Amazing what can be done - and how easily! I love the look of black and white with a pop of another color, but the kraft tag on the second card... swoon! Gorgeous cards! I really like the kissing technique you used on the first card! Great cards. Love the kissing technique on the first one. Wow! Love your color combinations! Beautiful cards. You've shown us two beautiful cards. TFS the kissing technique, I haven't tried this before but will be trying it soon. Loved, loved, loved the background on the music card - so creative. And truly loved your second card -- so creative. Thanks for sharing such great ideas! Oh my gosh, I love that "Kissing" technique. Those pretty pink musical polka dots are fantastic! Fantastic cards! I love the background you created for the first card - so much fun! LOVE THE GRWATFUL HEART TAG CARD. SPEAKS TO SO MANY PEOPLE. So pretty. I love the Grateful Heart set. I just love how all the elements came together in the first card--absolute perfection. 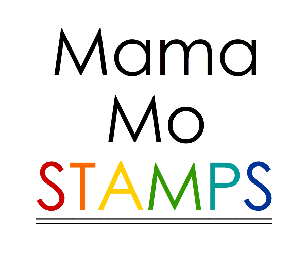 And I seriously NEED that sentiment stamp on the second card. It's totally wonderful. Thank you. Love the cards. Love how you did the background on the first card and the colors are great. Thanks for sharing. What a great idea to use the kissing technique with the polka dot stamp! So creative!I think the sentiments are so unique with these sets. Love them! That’s such a gorgeous duo of cards ! Stunning !!! Both cards are really eye-catching with black bakers twine the perfect finishing touch! Very creative !!! thanks for sharing your talent! I had forgotten about the kiss technique so thanks for sharing again. Love the polka dot background and even better with the kiss technique. Hooray! I was hoping someone would use the music background stamp, and what a great idea to use the kiss technique with it! It really does give a peekaboo look to your polka dots. I also really like the kraft/black/white card. It may be simple but it packs a punch, especially with the continued stamping outside the tag. 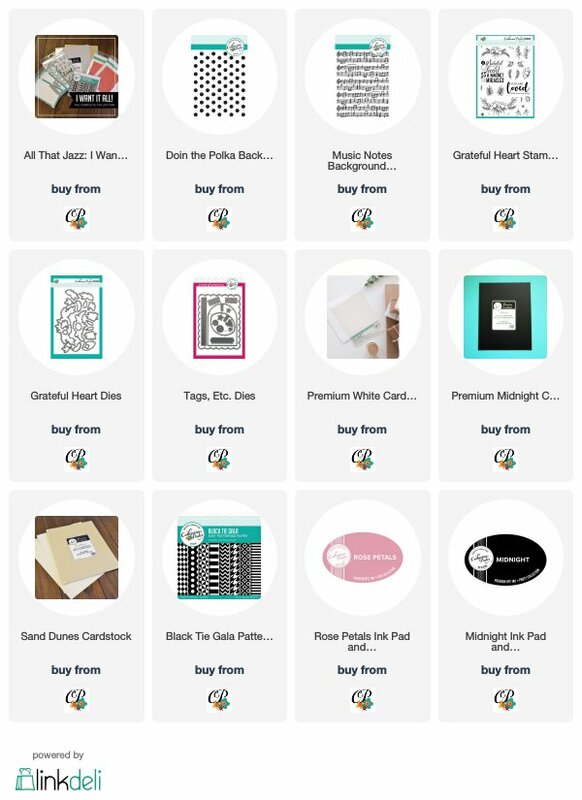 Thanks for sharing these lovely ideas with us! Oh.my.word. I LOVE that kissing technique! Can't wait to try it. I was in love with that Grateful Heart set before but your cards convince me that I need it!! Love them! Fun and beautiful cards, thank you for sharing your techniques. Just beautiful. I had already admired your first card at SN, but I love the second one too! I didn't think I needed either the music or the polka dots stamp, Wrong! I am not sure they would be the right size for this technique. What an enabler you are, Maureen. LOVE LOVE LOVE the example of Kissing stamping technique - - Really creative and quite stunning. 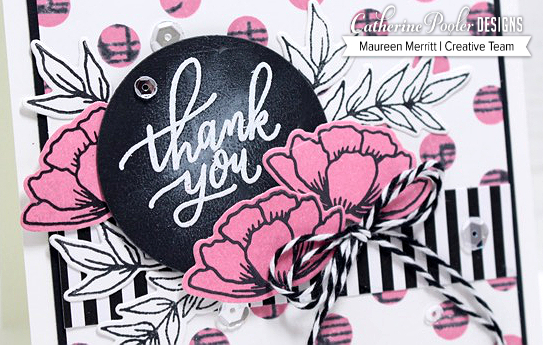 LOVE the pink and black and white card! I absolutely love the pink and black card. So cute!! Such pretty cards - love the pink and black color combo. That first card has such an interesting background! It's official - I can't choose! They're both great! 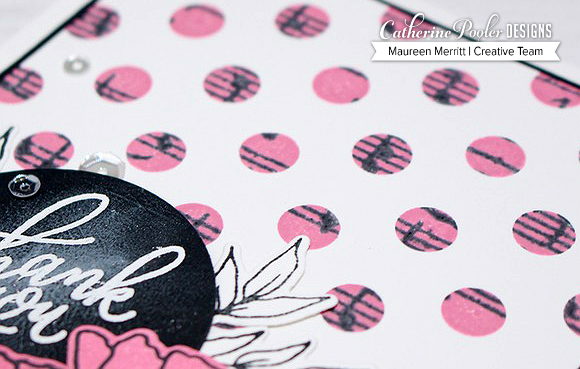 A very feminine card in pink and black combo ! And a beautiful card with those natural tones on the tag card. Absolutely beautiful showcase. Thanks for sharing. Gorgeous cards. Love how you did the kiss technique on the first card and I love those pretty flowers. I love that kiss technique but I don't think I have ever tried it, I sure hope I can remember to try it. I looked at the background on the first card and thought "how did she do that?" amazing - I love it. Both cards are beautiful - thanks so much for sharing your creations. Nice cards!! I especially like the pink and black! 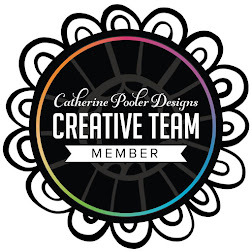 Love the way you used the polka dot background, very imaginative. Thanks for the inspiration.